Trade wars, interest-rate hikes, and U.S.-North Korean relations continue to dominate the news. We're in a sea of uncertainty. And markets hate uncertainty. Don't get caught up in it, though. Don't let the headlines scare you out of stocks. What if you'd let the U.S. credit downgrade scare you out of stocks in 2011? Or election uncertainty push you out of the market in 2016? You'd have missed out on a LOT of money. And today, selling because of the headlines is still a bad idea. Before we go any further, I need you to do me a quick favor. Tell me, why is everyone so worried? Where is the big crash? The chart goes from less than 2,000 points to more than 7,000. Not bad, right? 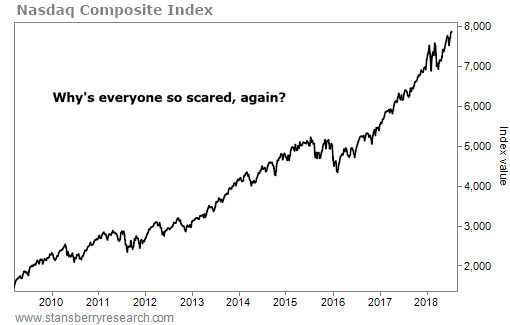 You would think that thousands of well-intentioned investors would "confuse genius with a bull market" and start pouring their money into stocks. You would think that we'd have a bitcoin-style frenzy in the stock market by now, right? I know this is subjective to say, but this is not what a major top feels like. I've been in the markets full time for 25 years. I have covered stock markets from all over the world, and all kinds of assets. Bonds, currencies, commodities, property, collectibles... you name it, I've been through it. I've seen a lot of major peaks in asset prices... And they all feel the same. Investors clamor for more and more. They throw caution to the wind, buying as much as they can with no worries. We saw it with bitcoin in December. Everyone I knew was asking me if they should buy. And every other news headline described a new batch of "bitcoin millionaires." Investor excitement was so thick you could cut it with a knife. The same was true for real estate a dozen years ago. Folks were giving up their day jobs to flip houses. The money was easy. And almost everyone had a false sense of security that housing was a "sure thing." The dot-com peak in 2000 was similar too. I had friends who started day trading and turned into millionaires. Businesses with no real plan to ever make money were going public... and soaring hundreds of percent in their first days of trading. It was crazy. Those moments are what tops feel like. You can feel the electricity in the air when everyone thinks they'll be the next one to get rich quick. We don't have that huge enthusiasm happening today. Today, folks are worried about trade wars. They're worried about North Korea. They're not ecstatic about stocks... And that tells me the market can still move higher. Now is a great time to make a contrarian bet on stocks... And a recent bullish sign agrees. "History says it could mean double-digit gains over the next year," Brett Eversole says. Learn more here: The Next Leg of the 'Melt Up' Starts Now. Ski-resort operator Vail Resorts (MTN) owns resorts and hotels in the U.S., Canada, and Australia. When you add up the costs of a ski vacation, you can see that when more people are flocking to Vail Resorts, it’s a good sign for the economy. 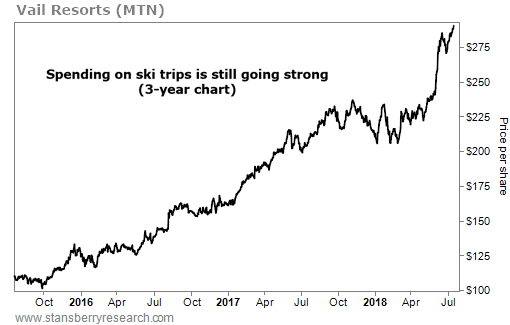 And that’s the case today… In the latest quarter, Vail Resorts reported net income of roughly $256 million – a 42% increase over the same period a year ago. And total sales increased 6.3% to more than $844 million.